'The European commission lacks the resources to be an effective administrative executive and lacks he legitimacy to be an effective political executive'. Discuss. a) Whereas effective in originating normally criticised for not having monitored enough. only 18 000 people. a) nomination procedurte undemocratic. should be council nominated? is there need for democracy? d) Historically importance has grown and now 80% is passed through Council as A legislation involving very little debate. e) However, implementation is mostly through directives that member states can ignore. g) In practice there is the ECJ and member governments can be taken to there. h) More and more responsibility in Common Market is shifted on Commission, although it does nothing with JHA and CFSP. i) European Parliament not yet a strong competitor. However, not the recent budget scandals. a) Functionalist design – originally the supranational Commission was designed to be weak. b) It has gained influence over the years. c) Very much depends on the president running it and particular time period. So no generalisation is very good. d) Still it is becoming more legitimate and administratively effective. The next challenge it faces is how to share powers with the parliament. The essay is about the much-discussed topic of where the power lies within European Union and how it should be exercised. There are two main centres of power: the European Council and the European Commission, with the European Parliament slowly gaining control as well. However, national governments, COREPER and a host of other institutions and pressure groups play an important role as well. Although it is widely accepted that although the Commission at present has less power than the Council, more and more power is given to it. It is not surprising then, that there are numerous criticisms with regard to Commission being able to handle the responsibilities. This essay looks specifically into to issues: administrative power and legitimacy of the Commission. Commission is a presidency comprising of either one or two commissioners from each member country whose aims are to work for the advantage of Europe, not to their national governments. There are several policy areas that normally one commissioner is responsible of (UK for trade as a wild guess J). Commission is thus set out to be a technocratic institution, relying on facts and optimal outcomes, rather than political ideology. It has a very vertically oriented structure, where different departments mainly consult only at commissioners’ level. Its president has extensive powers, however, the voting is done by simple majority and he is often outvoted. The size of the commission is very small compared to the national governments. Thus, the main form of organisation is initiation and then outsourcing. It turns out that the structure of the Commission is highly relevant in understanding the hindsight into the criticisms set out in the title. 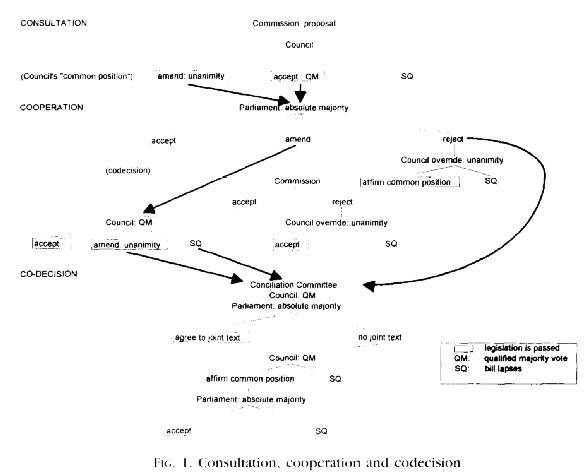 Still, the formal or ideal structure of Commission is very hard to analyse, because there are no similar international organisations in existence. The founding fathers of EU (Monet etc.) took a functionalist approach to Commission, setting it to grow and gain importance slowly as member governments realise its advantages. The alternative view of Commission as a support mechanism and 16th member state with its president sitting in the Council is called neo-realist. This view advocates a much smaller role to the Commission and is supported by Britain, Denmark etc. Tackling first the issue of administrative executive, the main point lies on the fact that the Commission size is not large enough (18000 people, most of them translators and support staff) to support the increasing responsibilities and tasks it has to carry out. Thus, it has to delegate the implementation tasks, mostly to national governments, but in the case of foreign aid for example, also to private institutions. Implementing the delegation is where the problem lies. I will first give an overview of the potential problems and then look at the solutions achieved with Maastricht and Amsterdam treaties. First, delegation to national governments implies long consultation periods and thus makes the policy very inflexible. In addition, once the policy is implemented Commission is very reluctant to bring about changes, because that would imply further negotiations. Due to the limited resources the Commission has, it cannot undertake several large negotiation procedures at once and thus administration is slow. However, it is not all due to lack of resources and neither is it entirely undesirable. Commission wishes to make its policies acceptable to every European government. In order to allow all parties concerned to raise issues that affect them, a long implementation is often desirable. In addition, by bundling together issues, Commission is able to achieve concession and intergovernmental co-operation that would otherwise not be possible. Despite this drive to greater acceptability, the second major administrative inefficiency of Commission is its lack of acceptability by the public. Brussels is viewed as being too distant and bureaucratic and its decisions not appropriate for the member states. Part of this view is deliberately created by politicians. EU is an easy target for criticism before national elections. Further criticism arises from the CAP and similar large-scale policies, which have very little economic justifications and exist largely because of the opaque policy making and pressure group influence. Lastly, the public perception is negative because the commissioners are not directly elected, and thus, according to some, not as accountable as they should be. Commission has tackled this perception, especially after the very narrow majorities achieved in referendums for the acceptance of Maastricht Treaty in France etc. I will discuss that further in the section about political executive. To make Commission more acceptable to national government and increase its powers, there are quite complicated rules with its power sharing with the Council involving the qualified majority and veto trade-offs etc. Amsterdam Treaty has simplified the process and made European Parliament more involved as well (giving it delaying capability for example). The president of the Commission now regularly has to address the Parliament. The problem in here lies of course in the fact that although EP is directly elected, the turnout is too low, MEP-s often come from minority groups and thus are not acceptable to national governments. Still, this should change slowly as public realises the importance of EP and voting by e-mail is finally introduced. Thus, one can argue that the Commission still lacks the resources of power, more than material resources, to effectively administer the national governments. However, the dynamics are favourable for administration efficiency. The second issue of legitimacy is a more fundamental problem including the desirability of democratic accountability, when it is apparent that it has a trade-off with efficiency. Being more specific, the appointment of Commissioners by national heads of government is not a very democratic process. On the other hand, it allows the heads to select unbiased people that would not represent rigid national views. It can be argued that through democratic choosing, decision-making procedure would be much more cumbersome and it would be harder to have a co-operating Commission. However, democracy is favoured by the public. It is very important to retain an outside impression of a democratic union, especially with the acquisition of new members. So, what has happened in practice? Commission role as an executive has surely increased. 80% of the legislature it proposes is now passed through Council as A-points without any voting. However, much of the executive decisions are still made by ECJ. British and others criticise the involvement of ECJ arguing that this goes beyond the role of just law creating assigned to ECJ by the Treaties. There have also been two major reforms to increase the legitimacy of the Commission. Firstly, the president Saunters said in 1992 that he would act as the EP must approve him. This increases the accountability of the Commission. However, as the recent budget scandal shows, parliament really could not force through its proposal to dismiss a few individual commissioners due to suspicion of bribery. The second reform to make the Commission more transparent will be carried out with the introduction of Amsterdam Treaties. Commission has traditionally been accessible to most interested pressure groups for lobbying. However, its decision making process has not always been transparent. This will change with the rules of conduct and agenda setting procedures. In addition, Commission will report much more than it did before. It is moving towards this now, with the information and reports they have on their webpage growing exponentially. What more can the Commission do to become more legitimate? British argue that maybe the Council instead of national governments should appoint the commissioners and there are many more proposals that are similar. However, the common aim of these proposals is to make Commission more acceptable to public, which is really the source of legitimacy. Then maybe the more direct route of advertising and using mass media would be more effective to reach that aim. Who knows? It is clear that the European Union system is guilty of many of the criticism outlined in the title and that Commission is causing part of the problems. Still, it is definitely not the only institution responsible for the public image of EU as undemocratic wharf. Furthermore, it is hard to envisage a system that would have gained so much importance with only 40 years and at the same time carrying out policies by using only democratic means. In addition, it is clear that the process of making the commission more effective and acceptable is constantly going on. The issue then is how to speed it up even further, what the trade-off should be in terms of reducing the new agenda that commission will undertake, and how much extra money it should receive from national budgets. Being from a prospective new EU member, I obviously want to argue that more money should be allocated and agenda should not be reduced, but I probably would not be that unbiased. However, any other similar recommendation is likely to be similarly biased. The final decision will inevitably depend very much on the new president that will be elected in two years. If s/he proposes speeding up the reforms significantly then Commission indeed will have been judged ineffective.